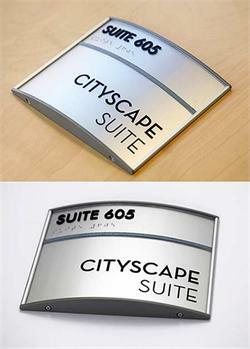 Contemporary curved signs - ADA braille restroom signs with raised tactile text and graphics. Grade 2 braille signs are a professional, clean look - a timeless addition to any bathroom in your corporate office building, hospital, clinic, university or school. 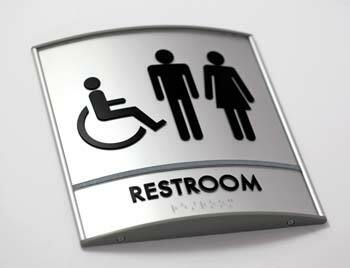 Customize this sign with the specific graphics you need for your restrooms. Text area measures 2" high and graphics area measures 6" high with overall dimensions of 7.87" wide by 8.1875" high. 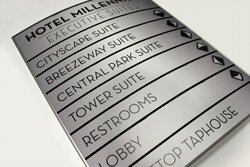 Lenses can be removed from the sign with the use of a suction cup, so if you need to update the graphics in the future, you can order a new lens instead of ordering an entirely new sign! 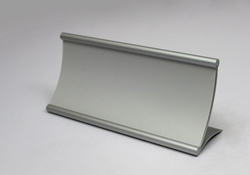 Metal frames are available in an anodized satin silver or matte black with your choice of grey or black plastic end caps and divider. Text and graphics are black. If you require a size not listed here, please contact us at service@officesigncompany.com or via phone at (701) 526-3835 with all of your details. 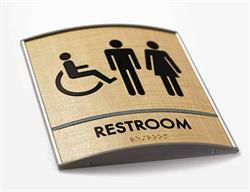 Customize your restroom sign text (standard text reads “RESTROOM” for unisex signs and "MEN" or "WOMEN" for single gender signs). Limit your text to 8 characters to comply with ADA regulations.